Complexo da Maré, located behind paneled walls along the expressway from the international airport, provides one of the first impressions of Rio de Janeiro. 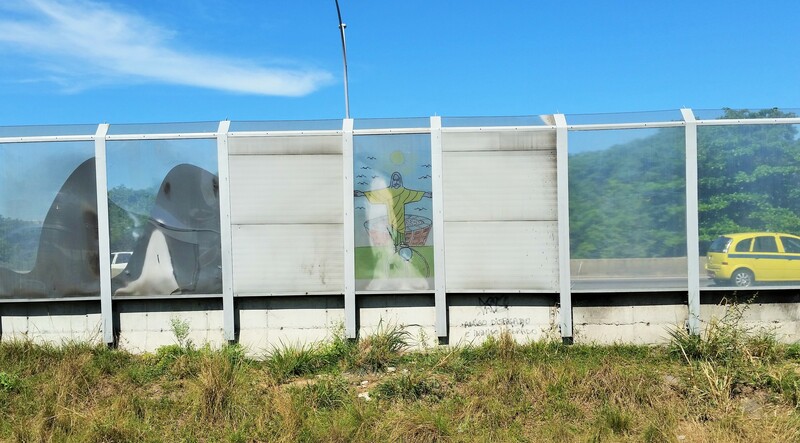 The walls are transparent, decorated with picturesque, childlike depictions of the city – soccer, beaches, Christ the Redeemer – that fail to fully hide the cluster of homes behind them. This is the north zone of Rio: working-class, full of concrete buildings and department stores, far from the beaches and winding sidewalks of the south. Don’t worry, travel books promise – the only time you’ll be in this area again is on your way home. After five months living in Rocinha, the city’s largest single favela located in southern Rio, I moved to Maré for a few reasons. I wanted a different perspective on the city, to live in a place without regular tourist visits, but I also liked it here: the residents were warm, there were a few great NGOs, the flat lay-out (as opposed to the hilliness of other favelas) made it easier to go to the grocery store or meet up with a friend. I was also drawn to Maré’s notoriety. The largest complex of favelas in Rio and located near the city’s national and international airport and port area, Maré occupies an important territory that continues to be contested by drug gangs and the police. In the leadup to the 2014 World Cup, while many favelas in Rio received Police Pacification Units (UPPs) in an initiative to rid them of drug gangs, Maré spent a year under the occupation of the Brazilian army. Despite plans to bring UPPs to Maré beginning in April 2015, the alleged occupation never seriously took place: while police cars now flash their sirens by Maré’s entrance points, they remain absent on the inside, where rival drug gangs maintain order. It’s their law here – meaning, for example, that you can’t walk around taking pictures freely, and unspoken rules of silence govern interactions between residents and outsiders asking questions. People living in territory controlled by one drug gang typically don’t go into, and remain suspicious of those from territory controlled by another. Setting up a blog in this environment has been really, really difficult. A lot of people don’t want to talk to me. A lot of people are too busy to talk to me. Some will talk to me but grow tense at the thought of their picture being taken. I wish I could say that this led to a lot of interesting answers. In reality most people didn’t know how to respond at all, and I don’t blame them in retrospect. I’m not sure how I would answer a question like that myself – especially if the person asking were a foreigner stealing time from my work and family, the things we tend to care about more than abstract ideas like self-representation. It was when I began to ask about those things – work, family, friends, religion, hobbies – that people started to really talk. I had originally planned to write a series of profiles on residents, but I soon realized that their stories were more powerful in their own words than anything my voice could provide. That’s not to say that my voice is irrelevant. It’s necessary, for example, to provide context about Maré and about the challenges of creating this project, and I’ll need it elsewhere to talk about difficulties in understanding: my Portuguese is good but not perfect; my cultural knowledge is growing but incomplete. 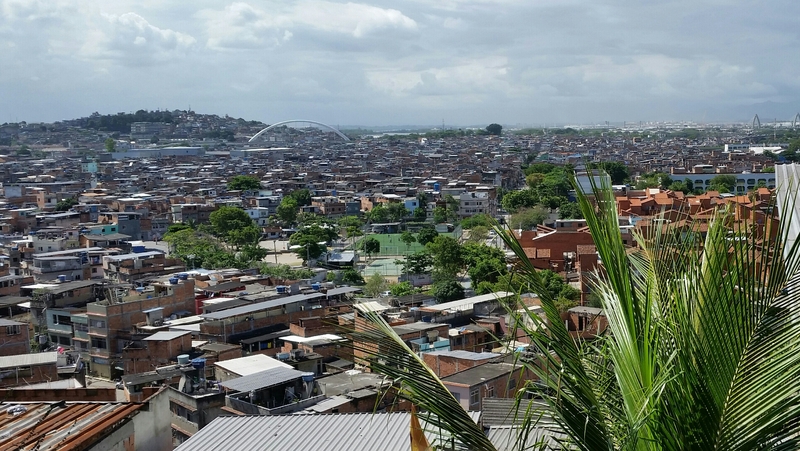 Yes, I’m living in a favela, but I’m living in a favela because I chose to – something which distinguishes me from just about everyone else here. My white skin and accent make it unlikely that I’ll ever raise suspicion with the police, and my education and background will always make it hard to relate to others here. All of these factors make this blog a work in progress. And I hope that it’s through embracing the challenges along the way, as opposed to avoiding them, that I can provide another perspective on the realities that people here experience. At first I was a bit scared by the drugs, sold openly on street corners, and the teenagers patrolling with fusils and semi-automatic weapons, but the reality of it all is much more mundane than movies and articles would have you believe. And as weird as it may sound, Maré is the only place I want to be in the world right now. I’m sick of reading articles about this place – and about favelas in general – that only focus on overused tropes of poverty, drugs, and violence. Of course these things are important. But so is understanding the reality of peoples’ lives. So I hope that these stories surprise you, and I hope that they change how you might think of those who tell them. They’ve certainly done both for me. Excellent! Excellent! I’m looking forward to future blogs. Very nice and I love the way you write expressing your reasons and the place itself. Katherine Boo’s description of the area in Mumbi by the airport, in Beyond the Beautiful Forevers, is quite similar. I cannot wait for the next installment. This is awesome, Sascha. Can’t wait to read everything. Straightforward and honestly expressed. The idea of asking people to simply talk (anonymously) about their lives is a good one. Some great stories are bound to come out of this. Keep on writing! Your presence, your ear and your words will touch both those you meet and those who read the dispatches. That is how you change the world. We look forward to being part of this. Sascha–You write beautifully. You bring you reader right into the thick of the setting. Your work is important in bringing us there in honesty and reality, be it grim or mundane. I am waiting to “meet” the individual people.